16 - 17 Nov 2018 Meiji: Annual Warehouse Sale 2018 with Discounts on Meiji Snacks, Hello Panda, Yan Yan, Meiji Milk & More! You’ve been asking for it - so wait no more! 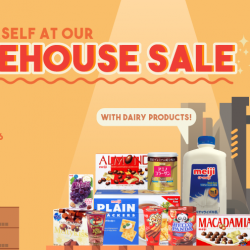 Come down to Meiji's annual Warehouse Sale at 36 Quality Road (S)618806 on 16-17 November, 10am - 5pm, to get your favourite snacks and dairy products from Meiji and CP Meiji Singapore including MeltyKiss, Hello Panda, Yan Yan and more. See you soon! Limited time only! Mr Bean: 1-for-1 Black Soya Milk + Chocolate Pancake Set Deal at Qoo10! Grab this exclusive Mr Bean deal at Qoo10 now! 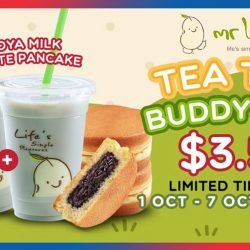 Get 1-for-1 Black Soya Milk + Chocolate Pancake Set at only $3.50! The only thing you have to take note: redemption is only during 2pm to 5pm and valid islandwide at 53 participating outlets excluding schools, polyclinics & hospitals. Redemption period will end on 7 Oct 2018 (5pm). Just flash your voucher to staff on Qoo10 app during redemption! Limited time only! 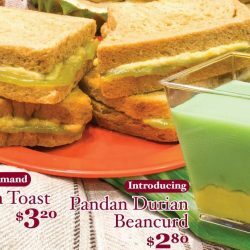 Mr Bean: 1-for-1 Classic Soya Milk + Ham n Cheese Eggwich Set Deal at Qoo10! Grab this exclusive Mr Bean deal at Qoo10 now! 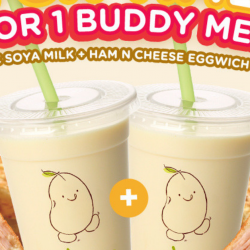 Get 1-for-1 Classic Soya Milk + Ham n Cheese Eggwich Set at only $4.90! The only thing you have to take note: redemption is only during 11am to 5pm and valid islandwide at 53 participating outlets excluding schools, polyclinics & hospitals. Redemption period will end on 30 Sept 2018 (5pm). Just flash your voucher to staff on Qoo10 app during redemption! 1 - 9 Sep 2018 Mr Bean: Flash These E-Coupons to Save Up to $1! Enjoy all these beanie-licious deals this September all at the tip of your hand! Simply download these coupons and flash it at any Mr Bean store to enjoy the special deals! Hurry, Soy Yummy! Soy Fun! See you there! 6 - 19 Aug 2018 Tsukiji Sush Takewaka: Try the Uniquely Singapore Hainanese Chicken Sushi for only $8! For this National Day, how about TRYING OUT this fusion of Japanese and Singapore Sushi? Bring out the Singapore Foodie in you! 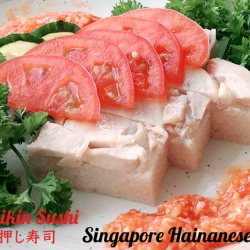 Head down to Tsukiji Sushi Takewaka from the period of 6 - 19 August to enjoy their creation Hainanese Chikin Sushi at $8! Just sign up for J Passport membership for free with their app! Limited time only! Burger King: The Rendang Burger & Hainanese Tendergrill™ Chicken Burger is Back + NEW Teh Tarik Pie! 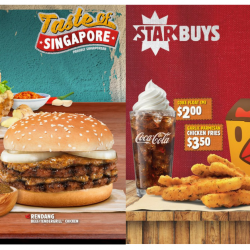 The Taste of Singapore is back at Burger King! Celebrate two proudly Singaporean flavours with the Rendang burger and Hainanese Tendergrill™ Chicken burger - rich, fragrant Rendang or spicy ginger sauce layered over juicy, flame-grilled patties in a toasted sesame seed bun. Try one today at any Burger King outlet islandwide! As snacks or add-ons, Starbuys always make for a satisfying munch! Bite into Garlic Parmesan Chicken Fries and try the all-new creamy Teh Tarik Pie! 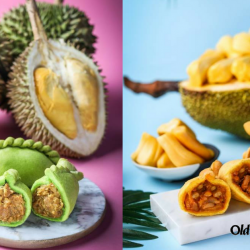 27 - 28 Jul 2018 Old Chang Kee: Try the NEW Durian Curry Chicken’O & Jackfruit Curry Chicken’O at Curry Day 2018! Curry, a Celebration of Singapore's Heritage! Held in conjunction with this year’s Singapore Food Festival, Old Chang Kee is proud to be the official organiser of Curry Day 2018 event which is a 2-days celebration of CURRY reaching out to the Singapore Community. Join in the Curry Movement with lots of curry related food and activities at Curry Day 2018, including trying the new and exclusive Durian Curry Chicken’O & Jackfruit Curry Chicken’O! The Chili Crab ‘O will also be available! 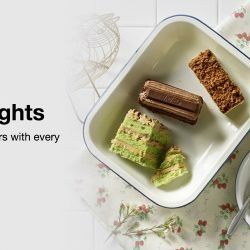 From 18 Jul 2018 Starbucks: NEW Local Delights Available for a Limited Time Only! Celebrating local flavours with every bite at Starbucks! 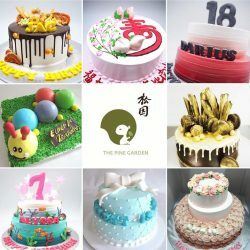 Try their specially created for Singapore pies and cakes from 18 July onwards! Available for a limited time only. The nation’s favourite Kaya Toast is back with a twist to celebrate Singapore’s 53rd birthday with the King of Fruits, the D24 Durian! This time, Ya Kun is also introducing the Pandan Durian Beancurd set to intrigue and delight your taste buds. Visit any of their participating outlets from 11 July onwards to try this and be sure to tag them in your photos! For a limited period only. 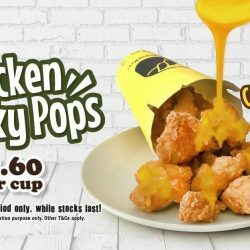 Old Chang Kee: NEW Chicken Chunky Pops with Curry Sauce Available for a Limited Time Only! Introducing Old Chang Kee NEW CHICKEN CHUNKY POPS WITH CURRY SAUCE to be launched for the month of July. Indulge in the Crispy and juicy Chicken Chunky Pops drizzle with our delicious and rich home-made curry sauce. Sold at all Old Chang Kee outlets at only $2.60 per cup! Valid for a limited period only! While stocks last! While stocks last! 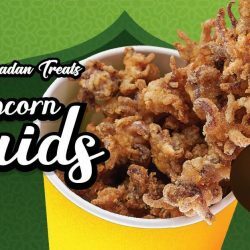 Old Chang Kee: Popcorn Squids Back with NEW Sauce – Nasi Lemak Chili! Popcorn Squids are back with NEW sauce condiment - Nasi Lemak Chili to go along with our crunchy baby squids! A real good match indeed! Available at all Old Chang Kee outlets at $3.50 per cup while stocks last! 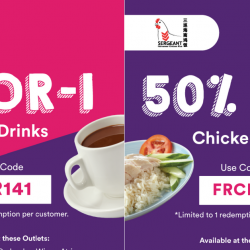 28 - 30 May 2018 Food Republic: Enjoy 1-for-1 Hot Drinks & 50% OFF Chicken Rice with FavePay! Enjoy your coffee break at Food Republic and pay with FavePay to get 1-for-1 hot drinks from 28 to 30 May 2018! Grab lunch at the same time and enjoy 50% off chicken rice at Sergeant Hainanese Chicken Rice! 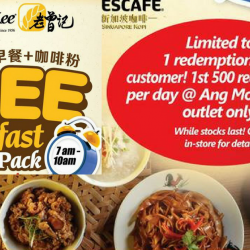 16 - 20 Apr 2018 Old Chang Kee: FREE Breakfast & Coffee Pack at AMK MRT Station! Free breakfast?! Yes it's for real! 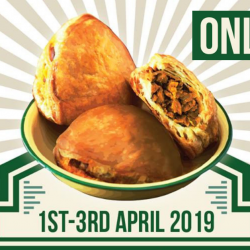 Old Chang Kee is serving up FREE breakfast and coffee packs from 16 to 20 April 2018 at AMK MRT station daily! Redeem it from 7am on 16/18/20 April and from 8am on 17/19 April 2018! 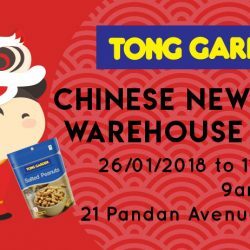 Till 11 Feb 2018 Tong Garden: CNY Warehouse Sale with Great Discounts on Nuts, Dried Fruits, Seeds, Chips & More! In less than 2 weeks time, we are welcoming the year of Dog  Have you done your CNY shopping yet? Do check out Tong Garden's CNY Warehouse Sales for attractive discounts on nuts, dried fruits, seeds, chips and more! On top of enjoying attractive discounts, there will be free giveaways and more! Till 15 Feb 2018 Fragrance Bak Hwa: Factory Outlet Sale with Cheap Deals on Bak Kwas, Pineapple Tarts, Sweets, Jellies & More! Have you started shopping for CNY goodies? Here's a sale you may want to jio your friends to go! Head down to Fragrance Bak Hwa's Factory Outlet Sale from now till 15 February 2018! 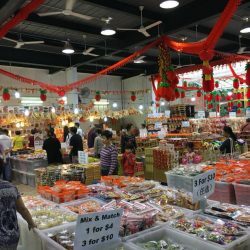 All the food you need during CNY will be on sale including Fragrance's signature bak kwas, goodies such as pineapple tarts, sweets & jellies, and even frozen ingredients for steamboat. While stocks last. OPENS DAILY FROM 9AM TO 8PM. 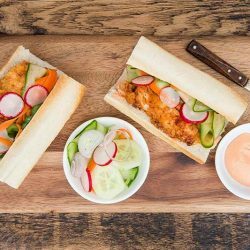 [THE SEAFOOD MARKET PLACE BY SONG FISH] Buttermilk Fried Chicken SandwichMarinating chicken in buttermilk enhances its flavor and making it moist and tender. Marinating chicken in buttermilk enhances its flavor and making it moist and tender. This recipe calls for a touch of spices and a sriracha mayo dip that goes with sweet and sour pickled vegetables. Song Fish stocks chicken breast (boneless and skinless) at $10/2kg packet. Come by and visit us or shop online today! 3...2...1.. Yes!! 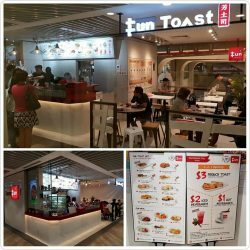 Our latest outlet now opens at North Point City, #02-170. [THE SEAFOOD MARKET PLACE BY SONG FISH] Steamed Cod Fish (蒸鳕鱼)“Home-cooked” comfort food that takes minimal cooking time and effort. "Home-cooked" comfort food that takes minimal cooking time and effort. Simple to prepare and a healthy dish too. 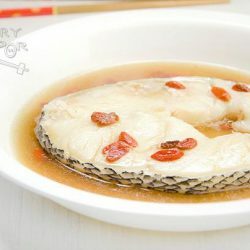 Steaming fish brings out its freshness and you could add in additional ingredients such as shitake mushrooms, tomatoes, and tofu to enhance the flavor. The steaming process creates natural juices from the ingredients which makes it a delight to pour over piping hot rice. Trick: Do not over-cook the fish by steaming it for longer than necessary, otherwise the cod fillet will become tough to chew on. 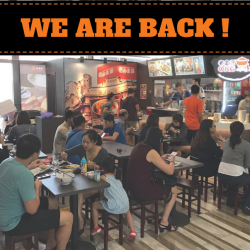 Returning to where Old Kim Guan all began, our NEWest outlet (launched in June 2017) is back at its former location @ Wilkie Edge #01-16(Selegie Area) just opposite Sunshine plaza, opposite the famous Selegie Beancurd. So if you are working around the area, or are tired from shopping in town and looking for some comfort food, feel free to drop by! 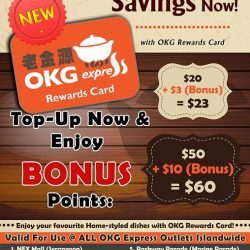 For our OKG Fans working in the area, you will also be glad to know that we are having a current Promotion for OKG Reward Cards  that entitles you to a FREE $10 Worth when you top-up $50. That's almost 20% SAVINGS  off your OKG favourites! 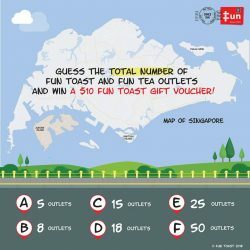 [Fun Toast] Our Fun outlets are now sprouting island wide closer to you!